For those wanting to work in Canada and eventually become a citizen, it would greatly help them to know by heart, Discover Canada especially the recently updated version. 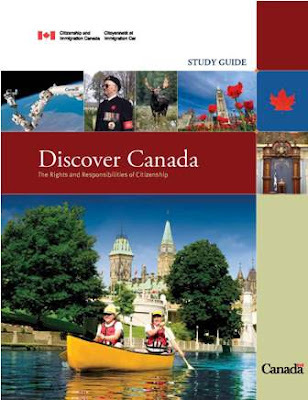 Discover Canada: the Rights and Responsibilities of Citizenship is a popular citizenship study guide read by Canadians themselves. It is also the official study guide for the citizenship test, a very good resource for citizenship applicants or for students simply researching about Canada. This comprehensive guide to Canadian citizensip was launched on November 12, 2009. It was updated to further strengthen its content on common Canadian values such as freedom, democracy, human rights, the rule of law and the equality of men & women. It is very helpful to understand Canada's history, values, symbols and Canadian institutions. It also highlights the contribution of ethnic and cultural communities in shaping Canadian identity and the sacrifices made by Canada's veterans. A new pull-out box called Becoming Canadian which emphasizes that a newcomer has a responsibility to embrace Canadian democratic principles and that past experiences in warfare or conflict do not justify bringing violent, extreme or hateful prejudices to Canada. Recognition that gay and lesbian Canadians enjoy the full protection of and equal treatment under the law, including access to civil marriage. The addition of forced marriage among the practices that are not tolerated in Canada. Additions to the section on the War of 1812, which celebrates its bicentennial next year. The section has been expanded to include more context on the conflict and its importance in shaping Canada. A revamped Modern Canada section including new headings, more content about trade and economic growth, and more examples of Canada’s outstanding cultural figures. Discover Canada: The Rights and Responsibilities of Citizenship can be downloaded or ordered from the CIC website. Click HERE. Citizenship applicants can contact the CIC Call Centre at 1-888-242-2100 for any questions.